There has been a lot of talks about doggy bags in France: do the French use doggy bags at all? Is it impolite to ask for a doggy bag in France? Is it customary? And most of all, how do you say doggy bag in French: what is the French translation? “Sac à toutou”? If the situation about doggy bag in France is still not very clear, one thing is certain: things are changing. “Le” doggy bag seems to be making its apparition on the French restaurant scene, and with the French government backing up the initiative, the French may very well adopt this once very foreign habit. So How Do You Say “Doggy Bag” in French? Apparently, the name is part of the problem. Even though they love their dogs, the French don’t seem to like “le sac à toutou“, literal translation for “doggy bag” nor anything suggesting that the leftovers of their scrumptious meals could be going to their four legged companions. Wikipedia suggests “un petit sac pour emporter les restes” – a little bag to take away the leftovers. Precise, but a bit long don’t you think? However, the French government has been launching a huge campaign under the name “le gourmet bag“… so let’s see if it sticks. Will Take-Away Boxes Finally Become a French Habit? Up to now, if taking home your leftovers is sometimes offered in ethnic restaurants in large French cities, chic or traditional French restaurants don’t offer to do so, and French people usually don’t dare asking for it. Many restaurants in France now offer take away food: “la vente à emporter“. So these restaurants have take away boxes, and you could possibly ask: “est-ce que je peux emporter le reste” (may I take away what is left – NOTE: I would not use “les restes” (the leftovers) which would probably sound bad to a French ear, but rather “le reste”: what remains…). According to the English newspaper The Telegraph, Guillaume Garot, Socialist MP who drew up a report in April 2015 on wasted food costs says: “most customers don’t dare ask for the remains of their meal, and restaurateurs can see it as ‘degrading’ their dishes”. However things are about to change. This report concluded that wasted food costs the average French household 400 Euros a year and the country up to 20 billion Euros. “Le Gourmet Bag” To Fight Against Waste – But is it a law? So it’s time to change. On April 7th 2015, the UMIH French food Union announced they signed an agreement with the startup TakeAway in order to promote the doggy bag in France and fight against waste. Will “le gourmet bag” suddenly become the restaurant owners’ best friend? Contrarily to the info that has been going all over the net, there was no law in 2016 requiring restaurants to provide a doggy bag to their customers. However, there is a new tax on food waste. Therefore, since doggy bags are a clear solution for restaurants owners to reduce their food waste, one could assume they are going to back up the gourmet bag initiative. Restaurants offering take-away boxes will also have a sticker on their windows. However, being able to provide a doggy bag and offering politely and systematically to do so (like it is customary in the US for example) is still quite a big leap. Will the French Ever Dare Asking for A “Doggy Bag”? So, it all comes down to the French customers: will they now dare to ask for a doggy bag? A recent poll conducted by a regional food and farming state body in southeastern France found that 75 per cent of French people would be prepared to use a doggy bag (The Telegraph). So, things could be changing fast. Next time you are in France, and you don’t finish your plate (unlikely I know) why don’t you try asking: “est-ce que je pourrais avoir un doggy bag s’il vous plaît ?” (may I have a doggy bag please?) and let me know how it turns out! Est-ce que je pourrais emporter le reste ? (may I take away what is left?). 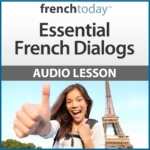 If you liked this article, you may also like “How To Comment About Food in French“, and “Les Abats: French offal names and common dishes“, as well “French Vocabulary About Cats And Dogs“.